One of the conundrums that has faced photographers since the very inception of the medium has been attempting to work out how to effectively capture movement. The representation of motion in a still image has been a problem with which many photographers have grappled and with which almost as many have come up with entirely different solutions. The potential ways in which you could go about capturing motion are manifold; one need only look at a selection of well-known photographs for evidence of this. The way in which you represent movement is likely to be determined by the nature of your subject. For example, if you are attempting to show the perpetual changing of lights in a night-time city scene, the method that you choose is likely to be different to that used if you were trying to show a child playing energetically. 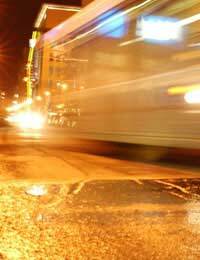 The capturing of motion depends in great part on effective use of shutter speed and aperture. Imagine, for example, that you wish to produce an atmospheric image of a dancer in mid-turn. By reducing the shutter speed you would create a representation of movement which would show sweeping, colorful lines and, perhaps, a ‘multi-exposure’ - that is, you would create several images of the same subject all exposed in one frame, as the subject will move during the time in which the shutter is open. When creating this effect, lighting can be difficult. If you are shooting in bright light then you may find that this is impossible as your images are over-exposed to the point of being unusable. You can try to combat this by using a smaller aperture and film speed (these facilities are covered in more depth in an article elsewhere on this site), but these will only go so far. In less well-lit environments, however, you may find that certain parts of your image are too under-exposed. This can be rectified more effectively by using a fill-flash. This function will produce enough light to reasonably expose the background of your fame, and when used in conjunction with a slow shutter speed can result in interesting light trails. It is not always necessary, however, to show the progress of movement in order to make it clear to the viewer that movement is occurring. Henri Cartier-Bresson’s famous image of a young man in mid-leap across a huge puddle is, in fact, a very sharp image with no hint of motion trails, but it is still clear that there is movement in the picture. Capturing this sort of image generally relies on a good availability of light. To produce a sharp result, it is necessary to use a fast shutter speed in order that the subject moves as little as possible during the period of time in which the shutter is open. Without enough light this could result in under-exposure, and so you may again need to make use of the flash, or increase the size of the aperture to ensure that as much light as possible is allowed onto the film or sensor while the shutter is open. As with so many other facets of photography, producing effective images of motion and movement is only ever the result of experimentation. So grab your camera and start shooting!